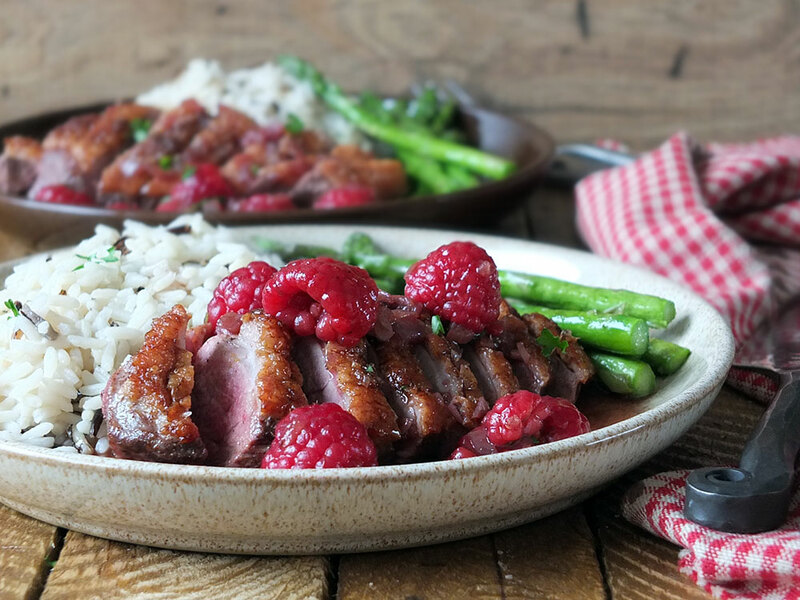 This succulent, crispy-skinned duck breast is seasoned with cinnamon and demerara sugar and is served with a simple port reduction sauce with raspberries. In collaboration with Just a Splash. 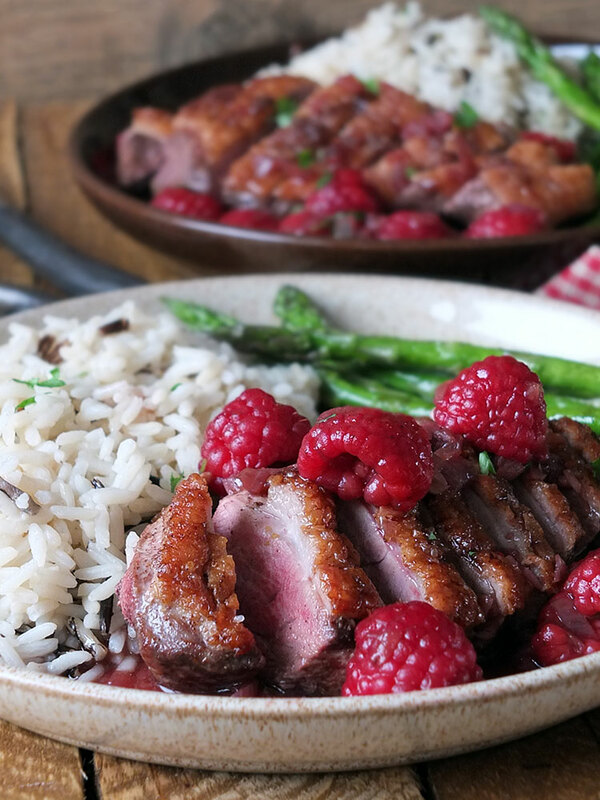 My husband, truth be told, doesn’t cook very often, but when he does it’s always something impressive, like sirloin steak (he makes the best steaks), coq au vin or a cinnamon-crusted duck recipe like this one, served with a raspberry sauce. The recipe he usually makes contains creme de cassis, a sweet, dark red liqueur made from blackcurrants, that costs around £10 per bottle. This bottle then sits in the back of the cupboard for a few years, taking up valuable space (and collecting dust) in our small kitchen. Eventually, it gets poured down the sink, and then we buy a new bottle, repeating the cycle. Sprucing up our home cooking recipes with a little alcohol certainly making cooking and baking more exciting, but when a recipe only calls for a small amount of alcohol, like creme de cassis, it can quickly become a little bit pricey. Wouldn’t it be nice if we could buy just the amount we need? 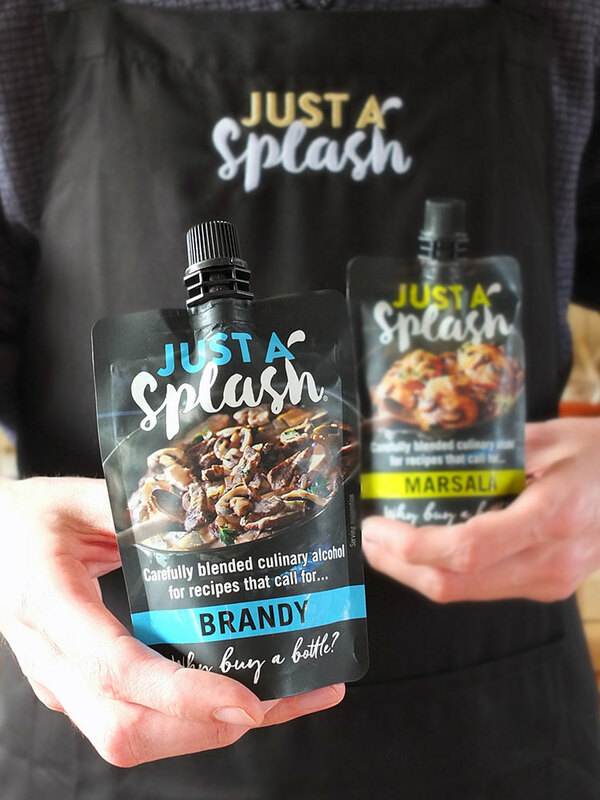 Just A Splash is an award-winning range of quality culinary alcohols in handy, recipe-sized 100ml pouring pouches. Spirits and fortified wines have a new lease on life as delicious cooking ingredients. No, these are not an adult juice-pack size of booze perfect for pocketing (surely I’m not the only one who thought that when they saw the packaging?). Available in rum, brandy, port, sherry and marsala, each variant has been crafted to offer the optimal blend of alcohol and seasoning to enhance the flavours of all your favourite sweet and savoury dishes. They are blended to contain a slightly lower ABV (alcohol by volume), which greatly benefits the cooking process, helping the food’s natural flavours to shine through. Each pouch retails for £1.99, but they are currently on introductory offer from Ocado for just £1.50. Given that a bottle of booze will usually set you back around £10 these culinary alcohols will save you money, cupboard space and food waste. Each sachet will last up to three months after being opened, so you don’t have to worry about using it all at once. Cooking with alcohol is as much about how it tastes as it is about what it does in the pan. When used properly alcohol adds a rich and warming depth of flavour to food. This happens through two processes, evaporation and molecular bonding. Alcohol molecules are incredibly volatile, so they evaporate very quickly, allowing the subtle aromas to hit our nostrils instantly which in turn enhances our overall perception of flavour. This ‘volatility effect’ works best when a dish has a lower alcohol concentration, like with some of the products in the Just A Splash range. Others in the range, like Rum and Brandy, have a slightly higher ABV ideal for flambéing. A simple splash of a spirit will naturally intensify the flavours of a finished dish by bonding with both the fat and water molecules, bridging the gap between the two. 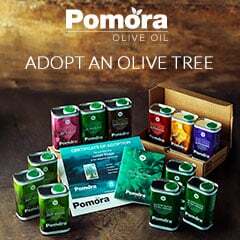 This is important because our aroma receptors respond only to molecules dissolved in fat, whilst food is primarily water. Alcohol, therefore, makes it easier for your aroma receptors to absorb the flavours of food. In a marinade, the alcohol would bond with aromatics like garlic and herbs that dissolve in fat, and help absorb the flavours into the meat. It also helps to tenderise the meat itself. By deglazing a pan with a spirit or fortified wine, the absorption of flavour into the browned proteins is more intense than if it were to be deglazed with stock or juice. Alcohol is only truly cooked off when it has met several criteria during the cooking process, such as duration of cooking, heat intensity, the amount and ABV of the alcohol, standing time, and even the size and shape of the cookware. If you want to flambé, you’ll need a higher alcohol concentration, so it’s important not to cook it off before you set the dish alight. 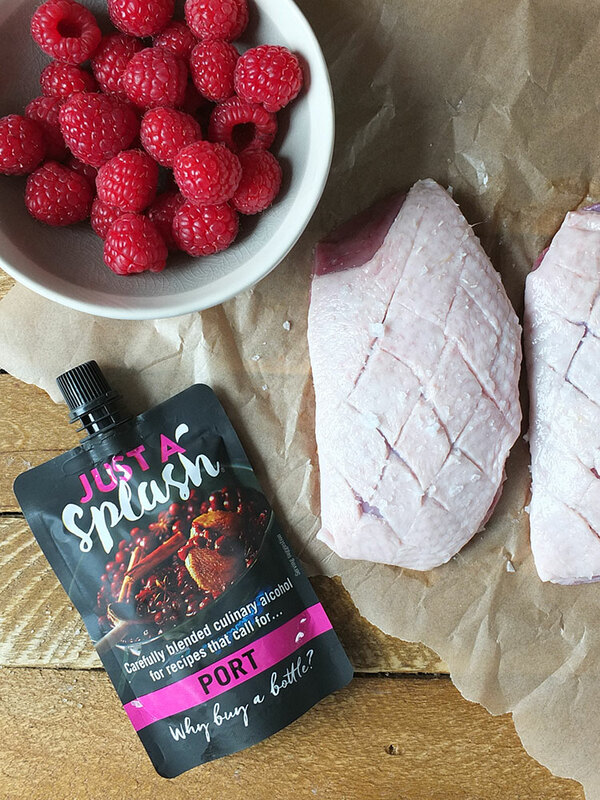 Inspired by my husband’s excellent cinnamon crusted duck recipe and these new cooking alcohol sachets, I’ve created my own pan-seared duck breasts with raspberry port sauce recipe. Step 1: Bring the duck to room temperature and salt the skin side. Heat a saute pan to medium-high and cook the duck, skin side down, for about five minutes. If your pan is hot enough it’ll start sizzling right away. If it starts smoking, turn the heat down. Step 2: Turn the duck over and sprinkle the browned skin with the cinnamon sugar. Turn over one more time, after the bottom has been sealed. Step 3: Transfer the duck to the oven for 8-16 minutes and saute the chopped shallot in the remaining duck fat (pour out any excess first). Step 4: Deglaze the pan with the contents of the Just a Splash sachet, and add the chicken stock and thyme leaves. Reduce heat and simmer to reduce. Step 5: Add the raspberries and heat through. Step 6: Remove the pan from the heat, stir in the butter and serve the sauce with the thickly sliced duck breasts. I like my pan-seared duck served with rice and a lightly cooked seasonal green, such as asparagus or rainbow chard. Truth be told, I can be a bit lazy when it comes to cooking, and I like to use those ready-cooked rice sachets – pictured: long grain and wild rice. My husband is the rice-maker in our house; he makes the lightest and fluffiest rice, but if I’m cooking it’ll usually be from a sachet. All my effort goes into the main dish. Pan-fried asparagus, also pictured, is one of my favourite sides for duck and steak. To make this I simply heat a little oil in a non-stick pan, pop the asparagus in and sprinkle liberally with sea salt. Then, I mostly ignore it, turning the spears once or twice if I remember, while I serve up the rest of the dish. By the time I’m done plating everything the asparagus is lightly cooked with a gorgeous crunch and texture. Pia Varma, founder and CEO of Just A Splash, grew up in a family of foodies. The idea for the business came about when she was following a cranberry sauce recipe by a famous TV chef and needed a dash of Port. Her only option was to buy a bottle for around £12, which would have made the sauce expensive. She spotted a gap in the market for convenient and affordable recipe-sized cooking alcohols and jumped on the opportunity. 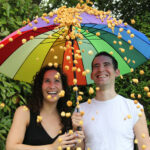 The idea is simple yet entirely unique – so much so that Just A Splash has carved out an entirely new category in the food industry and also won a World Food Innovation award for ‘Ingredient Innovation’ before the product even launched in 2017. In addition to the five cooking alcohols, Pia already has exciting plans for new innovative products, including boozy reduction sauces and glazes. 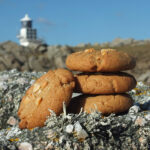 Visit the Just a Splash website to find out more and for some fab recipe inspiration. Follow Just a Splash on Facebook, Twitter and Instagram to stay tuned. What’s your favourite recipe that uses just a splash of alcohol? Let me know in the comments, and don’t forget to enter the giveaway below! 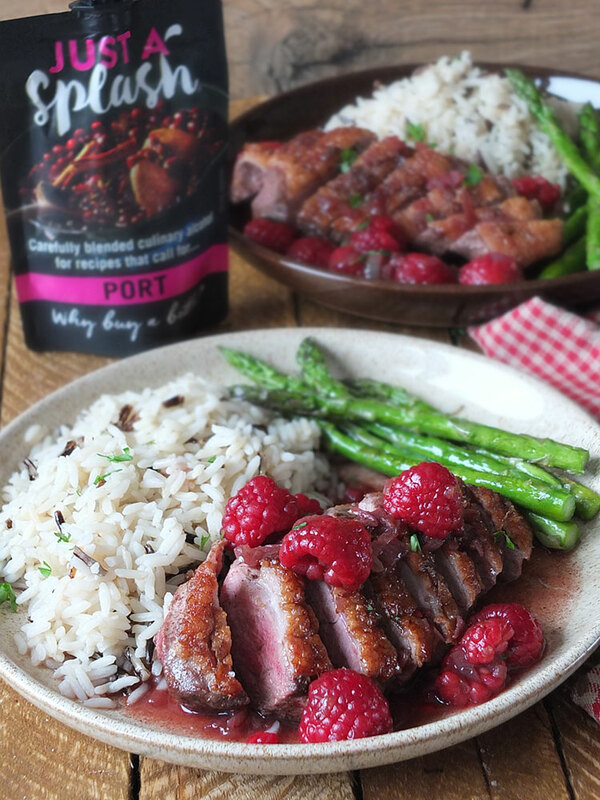 Crispy skinned duck breast seasoned with cinnamon served with a simple port reduction sauce with raspberries. Serve with seasonal greens and rice. 100 ml Port "Just a Splash"
Combine sea salt, demerara sugar and ground cinnamon in a small bowl and set aside. Bring duck breasts to room temperature for 30 minutes. Using a sharp knife, carefully cut away any excess skin/fat, leaving a 1/4 inch layer. Score the skin in a criss cross pattern, taking care not to cut all the way through the fat to the flesh. Bring a pan to a medium-high heat and fry the duck, skin side down, for 5 minutes or so, until it begins to crisp up. If the pan starts to smoke turn the heat down. Turn the duck over and sprinkle the skin side with the cinnamon sugar mixture. Cook for a further 2 minutes before turning the duck again, sprinkling the bottom with the remaining mixture. Cook for one minute longer and remove the duck from the pan. Transfer the duck breasts to a baking tray with a wire rack in it and cook in the oven for 8-12 minutes for medium rare, 15-18 minutes for medium. Saute the shallot in the duck fat remaining in the pan (remove any excess if there's too much fat). Deglaze the pan with the port and add the chicken stock and fresh thyme. Simmer for 5 minutes until it reduces slightly. Thicken with the cornflour dissolved in a little water and add the fresh raspberries. Take care not to allow the sauce to boil as you don't want the raspberries to dissolve. Remove the pan from the heat, add the butter and stir. Let the duck rest for 5 minutes before cutting into thick slices. Serve with the raspberry port sauce, some seasonal greens and rice. 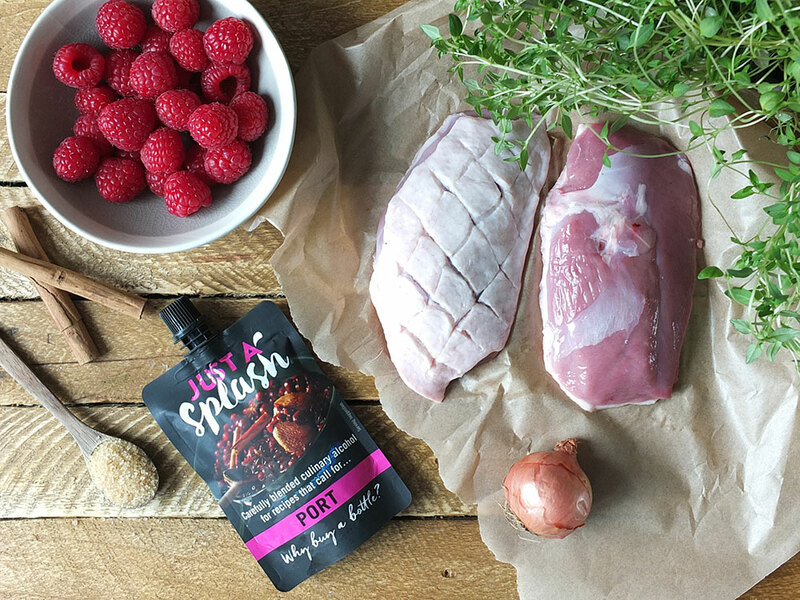 Just a Splash has kindly offered the chance for one of my UK readers to win a starter kit containing five pouches, an apron and recipe cards worth approximately £25. For your chance to win a Just a Splash starter kit worth approximately £25 enter using the Rafflecopter form below. Come back and tweet about the giveaway every day for more chances to win! The prize is offered and provided by Just a Splash. The prize is to win a Just a Splash starter kit worth approximately £25. There is no cash alternative and the prize is not transferable. If you need some help using Rafflecopter, here’s a quick clip to show you how. Rafflecopter will pick the winner at random from all the entries received. I will be verifying entries. 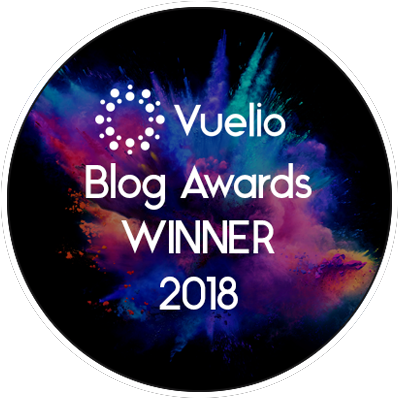 Closing date is midnight (that’s 00:00 hours, 12 am on Sunday night/Monday morning) on Monday 30 April 2018 (GMT). The winner will be announced afterwards. 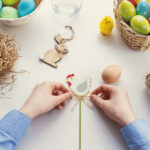 This is a sponsored recipe post in collaboration with Just a Splash. Thank you for supporting the brands who make it possible for me to do what I love: mess up my kitchen and share recipe stories. ‘Just a Splash’ is such a fantastic idea. I cook a lot of Mediterranean vegetable soups & sauces, these “just a splash” pouches would be really useful. What a great idea! I would use the brandy one with some chicken liver and caper berry Spanish dish. I’d try Creamy Chicken Marsala – these are such a good idea, who wants to buy a whole bottle of Marsala just for one recipe? 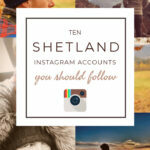 These are such a great idea…. I would use them in some sort of dessert…. I have always been a big fan of roasted duck. I have never had this version but I surely can’t wait to give it a try. Everything looks so perfect and yummy. These are interesting! I’d well be up for trying the brandy one because I love vegetarian stroganoff but I can never excuse buying a full bottle of brandy just for stroganoff when I don’t actually drink it. What a bloody good idea. Duck works so well with fruit. I love the sound of those sauces too, must look out for them! That sauce sounds absolutely delicious. My husband loves duck, but I never cook it, so will have to give this a try. We are loving the Just a splash pouches – so handy. I do like to smash a good bit of alcohol into meals.. I think it really makes the flavour 9 times out of 10. So those little packets are so handy! I’d use them that’s for sure. I also love the look of this meal. Ducky is one of my favourite dishes! 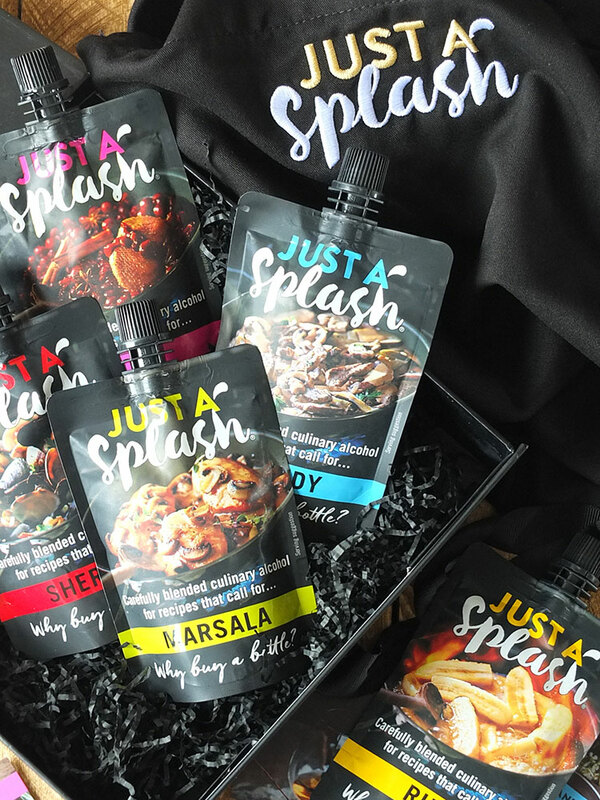 I love those ‘just a splash’ pouches, what a brilliant idea, perfect for chefs like me who like an occassional splurge in the kitchen! This is so yummy! 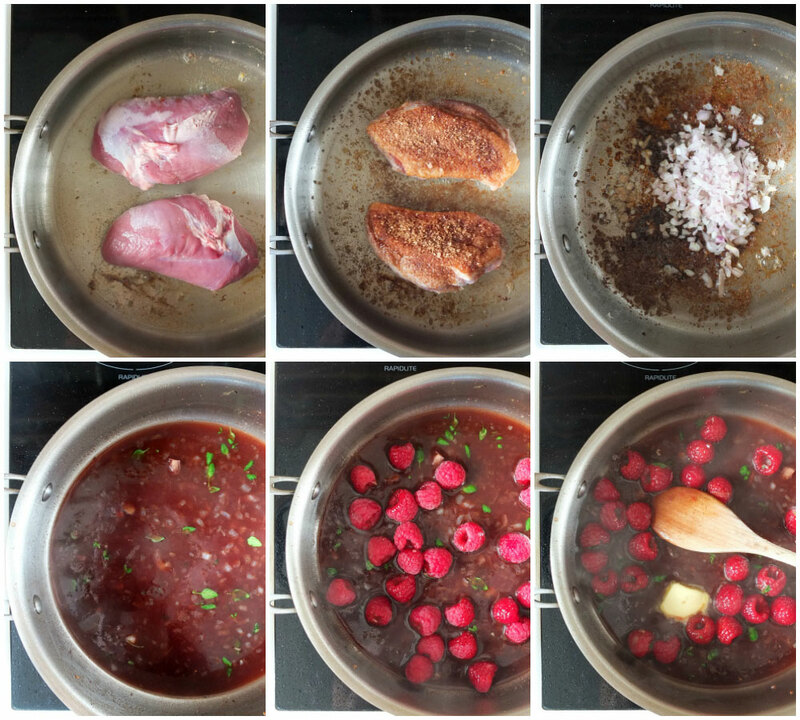 I have to try this raspberry port sauce. I think it does wonder when added to these kind of dishes. Oooh this looks delicious!! 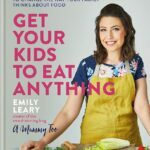 I am on the hunt for new recipes and this looks great! Wow this sounds utterly delicious! 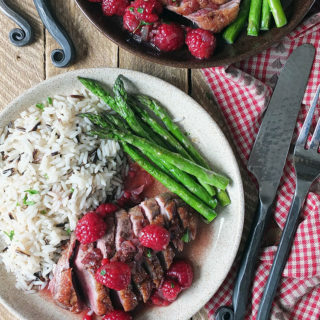 I’d never think it combine duck with raspberries, I bet it’s so good! I’ve never heard of Just A Splash before but I’m really interested! We love cooking at home, but it’s usually just me and my husband as the kids are all grown up and have families of their own. I’d love products like this! Oh my goodness how delicious does this look! I have to admit to being quite a fan of duck and this sounds like it has so much flavour to it. I’d use them in the pan-seared duck breast. This sounds so good! I’ll have to show it to my mom who loves duck. 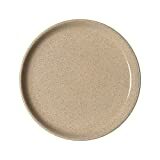 the Creamy Chicken Marsala looks so yummy! This is bound to be a favourite for my husband who loves duck, the addition of raspberries is such a nice idea. I have a sweet tooth so would use them in desserts. I’d really like to see if I could use them with a stir fry? 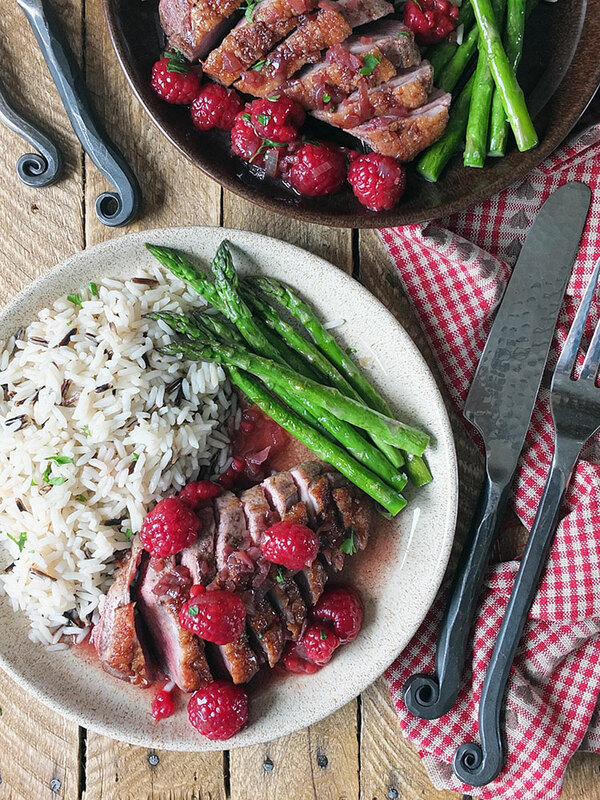 I think I’d use your Pan-Seared duck breast with raspberry port sauce recipe as it sounds delicious!